Dart Pro 2 BBC Head UNKNOWN - Dezod Motorsports Inc - Home of the automotive performance enthusiast since 2002. The Pro 2 cylinder heads were designed to make competitive engine building easier and less expensive by incorporating the rugged features of our famous Race Series casting into a ready to use, professional quality competition cylinder head. 100% CNC machined on precision 5-axis machining centers, the Pro 2 head offers awesome power and unprecidented ease of use. Premium alloy: Dart aluminum heads are cast from virgin 355-T61 aerospace alloy for superior strength and integrity. Bolt on compatibility: 2 degree rolled valve angle and standard spacing accommodates all stock accessories. Heart shaped 121cc chambers improve combustion efficiency. CNC machined for consistency and power. Raised spark plug location improves flame travel for a quicker, more complete burn, producing more power. *Multi-angle intake seats and radiused exhaust seats greatly improve air flow. Brass head bolt tubes are inserted between adjacent intake runners to allow the ports to be widened. Spark plug holes are machined for gasketed 3/4” reach plugs. Manganese bronze valve guides ensure long term reliability. 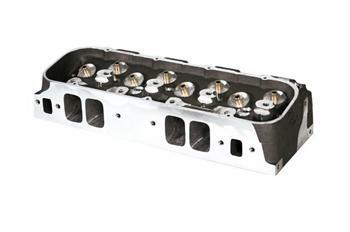 All cylinder heads sold individually.